A newly developed analysis method can detect hydroxyl radicals (OH) with unprecedented sensitivity. Because OH is a critical component in the combustion processes that power most vehicles, the new approach could advance the development of novel types of engines and fuels that would be more efficient and environmentally friendly. "In the U.S., combustion produces 60 percent of our electricity and powers 90 percent of ground transportation and almost all aviation," said lead researcher, Shengkai Wang a postdoctoral research fellow in mechanical engineering at Stanford University. "The ability to examine combustion processes and understand them at a more fundamental level would aid in the development of next-generation combustion strategies that can increase efficiency and reduce pollution," he said. In The Optical Society (OSA) journal Optics Letters, Wang and Ronald K. Hanson, professor of mechanical engineering at Stanford, report a spectroscopy-based approach that detected levels of OH radicals at least four times lower than the previous best method used to analyze OH. Among hundreds of molecular entities involved in combustion reactions, OH is the most important because it determines whether and how fast the fuel will burn. "OH is extremely difficult to measure, especially in the dynamic and noisy environments of fuel combustion, because it is highly reactive and present in very low concentrations," said Wang. "Our approach paves the way to practical detection of OH in the parts per billion range." The new approach could also be useful for applications such as studying atmospheric chemistry, where OH is a key player in the formation and depletion of ozone, Wang said. One bottleneck to commercializing new types of engines or optimized fuels is that their combustion chemistry isn't fully understood due to a lack of sensitive analysis methods. To solve this problem, Wang and his colleague developed a technique known as frequency-modulation spectroscopy using ultraviolet (UV) light. Spectroscopy works by shining a laser beam through the test gas, where molecules will partially absorb the light. Analyzing the light leaving the gas sample can determine exactly which molecules, and their quantities, were present. However, spectroscopic measurement of OH is not a trivial task. The extremely low amounts of OH present in combustion reactions, combined with high reaction temperatures and various sources of noise such as mechanical vibrations and gas turbulence, make practical detection of OH very difficult. Rather than using one laser wavelength, frequency-modulation spectroscopy examines the differences in light absorption between multiple wavelengths, allowing any noise common among the readings to be subtracted. The method also shifts the signal coming from OH absorption to a higher frequency, thereby eliminating any low-frequency drift that challenges OH measurement. 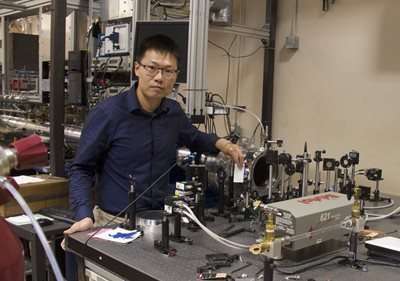 "The general idea of frequency-modulation spectroscopy has existed for a while, but we are the first to demonstrate its applicability to detecting OH at this particular wavelength range," said Wang. "One reason this hasn't been done before is that the high-quality UV laser source necessary to measure OH absorption became available very recently." The researchers tested their new approach by studying the combustion reaction of a representative fuel, iso-octane, in a controlled reactor. They were able to achieve a minimum detectable absorbance of 3.0 X 10-4 at a temperature of 1330 K. This is equivalent to detecting 85 parts per billion of OH over 15 cm optical length and is four times better than the best record previously reported. As a next step, the researchers plan to incorporate better optical components, which they say could improve the sensitivity by another order of magnitude. They also want to make the equipment more portable so that it could be transported on a cart to various specialized testing facilities. A portable system would also allow them to use the approach to make measurements in practical engine conditions and to eventually adapt the method for making measurements in realistic engines and combustors.